Grisi Mother of Pearl is a soap bar formulated with Mother of Pearl and natural ingredients that helps cleaning your skin and maintaining its freshness. The Mother of Pearl bar soap is great for Ageing, Wrinkles, skin impurities, freckles, discoloration, Malesma, Acne, and acne scars. Its continued use helps little dark and age spots vanish. Its delicious fragrance will scent your skin and its exclusive cream Humederm moisturizes and restores your skin to its smooth and natural appearance. Mother of Pearl Lightening Soap. 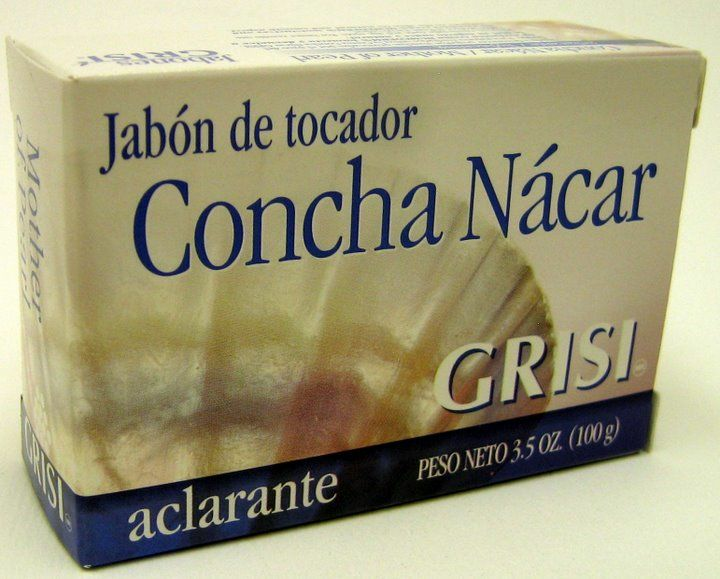 El Jabon concha nacar aclarante de Grisi, es un jabon a base de ConchaNacar. Formulado con ingredientes naturales que ayudan a limpiar la piel conservando su lozania. 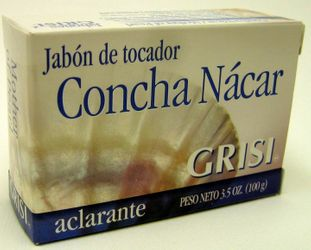 El Jabon Concha Nacar es bueno para el Envejecimiento, Pano, Acne, Arrugas, Cicatrices, Cicatriz de Acne, Pecas e Impurezas de la piel. Su uso prolongado ayuda a desvanecer pequenas manchas provocadas por el paso del tiempo. Su delicioso aroma perfuma tu piel y su exclusiva crema Humederm humecta y devuelve a tu piel su aspecto suave y natural.